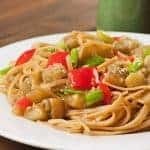 This easy, Chinese-style noodle toss combines eggplant, red bell pepper, scallions and a richly-flavored ginger garlic sauce with whole wheat pasta to make a satisfying meatless meal. Heat the vegetable oil and 1 tablespoon of the sesame oil in a large pan over medium heat. Add the garlic and ginger and sauté until fragrant and barely golden, 2 minutes. Add the red bell pepper and continue cooking 1 minute longer. Stir in the chicken broth, soy sauce, rice vinegar, sriracha and sugar. Add the eggplant and stir to coat with the broth. Bring the mixture to a gentle simmer, then cover and cook, stirring occasionally, until the eggplant is tender, 7 to 10 minutes. While the eggplant simmers, cook and drain the pasta according to package directions. Drizzle with the remaining tablespoon of sesame oil and set aside. Season the eggplant mixture with freshly ground black pepper and a pinch more sugar if desired. Whisk the cornstarch into the remaining 1/4 cup of chicken broth and add it to the simmering sauce. Continue cooking just long enough for the sauce to thicken to a glaze, 1 to 2 minutes. Stir in the scallions, add the mixture to the pasta and toss to combine. The nutty taste of whole wheat pasta is a great complement to the flavors in this dish, but regular pasta will work as well – or, serve the eggplant over steamed white or brown rice.